I guess you’d have to call a novel about the Brontes a literary novel. And I don’t read those. 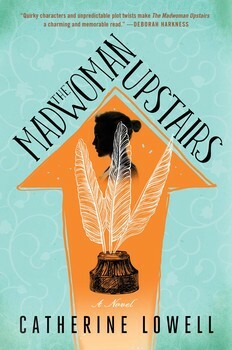 I do, however, love Jane Eyre, so I wanted to see what Catherine Lowell’s Madwoman Upstairs was like. Thank heaven I majored in English. So did Lowell. She must have paid more attention than I did. Many of the references went right over my head. Nonetheless, the book is funny and engaging. Samantha Whipple (what a name) is an American descendant of the Brontes who arrives at Oxford to study. Her tutor isn’t the elderly man she expected. He is, of course, young and attractive in a non-professorial way. Rumor has long had it that Samantha’s late father inherited valuable Bronte artifacts and memorabilia. As far as she knows, all of his possessions were lost in a fire. Then his heavily annotated copies of the Brontes’ books mysteriously start to appear in the highly idiosyncratic tower room to which Samantha has inexplicable been assigned. Samantha follows a few plot twists and turns to unravel the mystery of her inheritance and of her father. The epilogue is particularly fitting, but don’t cheat. Wait until the end to read it. Reader, I devoured this book.